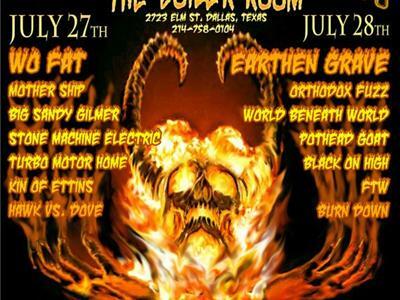 July 27th & 28th, Ripple Music will be sponsoring the Metroplex Heavyfest in Dallas, Texas and this episode . . . well, this epsiode is a precursor to the debauchery and bedlam that will certainly ensue at a gathering such as this! Pope and Racer will be previewing some of the acts over the two day festival, which will be MC'd by Dave Sherman (Earthride/Spirit Caravan). This episode will feature tunes from headliners Wo Fat and Earthen Grave, as well as a supporting cast of characters in Mothership, Turbo Motorhome, Pothead Goat, and much more. We'll even have a drop-by from the big man putting on the show, "Big" Jay Brockington. Tune in or download . . . you won't want to miss out on the heaviest movement in Texas! The best music that you're not listening to . . . The Ripple Effect!